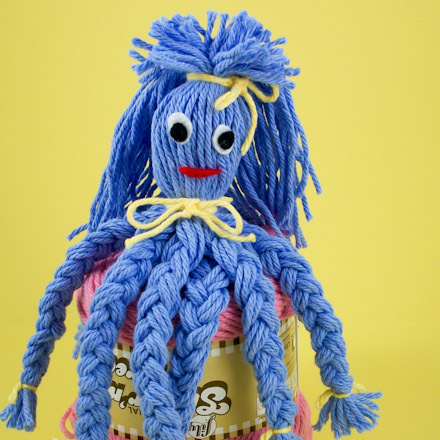 In this craft project, learn the British way of making a yarn octopus. 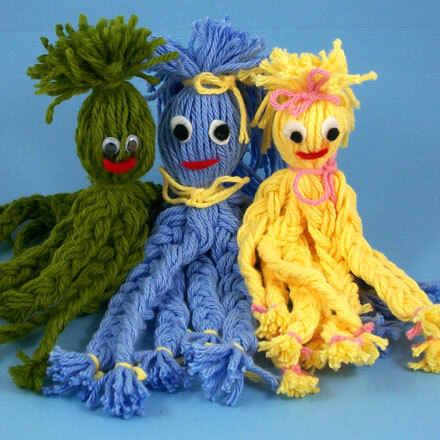 This technique is a disarmingly simple way to make a cute toy with items found in most people's homes, and it will use up those leftover scraps of wool (yarn). This is a great project for groups of kids or family craft time. 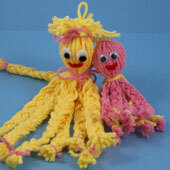 Grandmas are good sources of odd balls of wool, and will enjoy making woolly octopi with the kids. 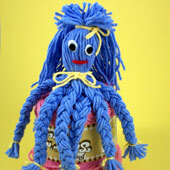 Related craft: Make a little Yarn Octopus using just a ¼ ounce of yarn and wiggly eyes. Wind the wool around the length of the book (not too tightly) 40 to 60 times until you have a nice wodge of wrapped wool. Cut this off from the ball of wool. Carefully take your wound wool off the book. Using a short piece of wool, make a tight tie around the wound wool, about 1" to 2" (3-5 cm) from the top. This forms the hair for the octopus. Make another tie a further 3" to 4" (8 - 10 cm) down to form the octopus' head. Using scissors, cut through the small loops at the top. This will be your octopus' hair. Cut through the large loops at the bottom to form the octopus' legs. Trim the hair to whatever style you wish, being sure not to cut too close to the tie. Turn your octopus upside-down and hold its head between your legs. Divide the cut wool into eight even "legs" and plait (braid) each in turn. Use short lengths of wool to tie off each leg, and trim the ends. Your octopus is almost complete. Using the felt, cut out eyes and a mouth, and glue on. Tip: If you like, use wiggly eyes in place of the felt eyes. That's it! Does your octopus need a buddy? Thanks to Louise L. for sharing this craft idea with Aunt Annie's Craft Exchange in 1996. Louise suggested, "You can make a small octopus as a baby's toy by leaving one of the loops intact when cutting the hair. Now you can attach this little octopus to your baby's pram or cradle, and it will bob about when hit by the baby! See the loop on the yellow octopus below. 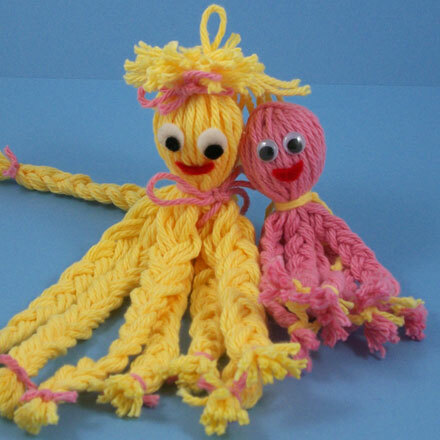 Tip: Make a little Yarn Octopus to go along with your woolly octopus. Tip: For longer hair, wrap the yarn around a larger book (12" works well) and make the top tie further down. Instead of cutting the hair loops at full length, cut a "fringe", allowing the rest of the wool to form the long hair. You can then fix up the hair as a pony tail, plait it or leave it down.